There’s no secret why vodka is one of the top selling spirits in the world: it’s crisp, clean, and easy to drink. Throw vodka into a glass of ice, add some soda, and you’ve got a quick drink that you don’t have to think about. Vodka by design is meant to be neutral, affable, and generally inconspicuous in drinks. The problem with some vodka is that, by design, they can lack character. Brugal Rum has just introduced a compelling alternative for vodka drinkers who want the light, easy nature of a more neutral spirit but with a little more character. Brugal Extra Dry Rum is a crisp, clean rum with a light and enjoyable flavor. Like many great rums, Brugal Extra Dry is made from molasses, a byproduct of turning sugar cane into crystallized sugar. Molasses helps impart a nice toasted marshmallow flavor along with vanilla, a hint dark chocolate, and cream. None of the flavors are bold or overly assertive, and the rum lives up to its “extra dry” name with a clean, dry finish that only has hints of sweetness and the suggestion of peppery spice. 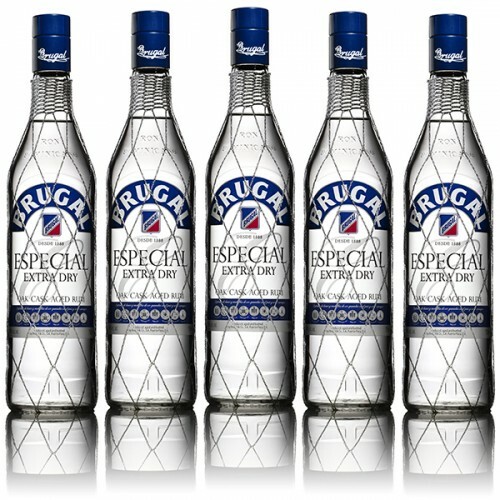 Although it’s a white rum, Brugal’s Especial Extra Dry Rum is actually a blend of aged rums aged an average of 2 years. The aged rums are blended specifically to enhance the light and easy characteristics, and then run through a special carbon filtration system three times to strip out the color and refine its clean, dry characteristics. Brugal Extra Dry is an easy stand-in for the traditional ‘vodka & soda’, but it also goes well in a mojito, daiquiri, and of course in Coke. Brugal Extra Dry is 80 proof (40%) alcohol and is available in select markets including NY, SF, and LA for around $20 a bottle. Directions: Combine all ingredients, except bitters and shake with ice. Pour into a Collins glass, top with Club Soda and float 3 dashes of bitters. Garnish with a mint sprig. Get a complete behind the scenes look at Brugal here.